And the wind blowin' in my hair"
That's the chorus to the song "The Coast" on the new album Court Yard Hounds by two of the three Dixie Chicks (DC) - sisters Emily Robison and Martie Maguire. I was a big fan of the Dixie Chicks and was sad when country music turned its back on the group. No, I didn't agree with what they said on that stage in London (I think it was in London) but then again I don't particularly like it when any musician, actor or entertainer uses their celebrity to pontificate. I don't think Shakira, Susan Sarandon, Julia Roberts or other celebrities should be testifying as experts in front of Congressional hearings, but they do. However, we do live in a country where free speech was, is and will be fought for so I don't really understand why the Dixie Chicks were treated like they were. If you don't like what they stand for, don't buy their albums or go to their shows but don't force them totally off of the radio and out the door. For example, I don't like it that the sales of one of Carrie Underwood's songs on iTunes went to support the Humane Society of the United States (HSUS) - this group is not your local animal shelter but an extreme animal rights group - so I didn't buy the song and I don't buy any of her other CDs but I don't want her off of the radio. It's my choice not to support her or her causes - that's my right. Wow, I really got off track there...but back to the Court Yard Hounds. I really like the new project by the DC sisters. It's mellow and has some great lyrics. Emily and Martie were known for their skill on multiple instruments like the fiddle, banjo, guitar and mandolin in their DC days but they have beautiful voices and harmonies too. My favorite songs are "The Coast," "I Miss You," and "It Didn't Make a Sound." "Ain't No Son" really reminded me of the Dixie Chicks sound. I could really tell that Emily Robison had recently been through a break-up...I think some of her feelings are reflected in the songs which she mainly co-wrote with Martin Strayer. If you are a fan of the Sheryl Crow, I think you'd like the Court Yard Hounds. Don't dismiss the album as country - it's more than that. This CD is in my car and the songs are in my iTunes Shuffle. The songs haven't made it into my Exercise playlist but they are on my Work playlist! Have you bought any new CDs or songs lately? If so, I welcome suggestions! I am following you now thanks to Social Parade! It would be nice if you could share back the love on my blog! Also for more blog-handy tips check Technical Support! Happy Friday! I am completely with you on the Dixie Chicks! I have all the CDs (Dang! I a,most said albums!, but I do not have this new one. Now I think I will have to go out and buy it. I will miss that other voice, but I am looking forward to hearing their twang again. I truly thought by now someone would have opened Miss Carrie's eyes to HSUS, and I am even more surprised that all the country guys and gals have not raised a little ruckus about it? Thanks for the tip and sneaking in the editorial. I need to do that a bit more in my own blog. Not a huge country fan myself Megan, but D.C. has had some good stuff. Thanks for letting me know about the new CD...and I couldn't agree with you more about Country turning their backs on them. I boycotted Toby Keith during that time! P.S. 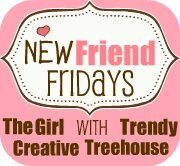 - LOVE the new header on your blog! Following you back from Friendly Friday - thanks for the comment. Nice blog - I enjoyed reading your posts. Following through GFC from SPFF. Just visiting to say hello from the social parade. Come and check out my giveaway with low entries that ends tonight. Hello! I'm your newest follower from FFF. Can't wait to read more! 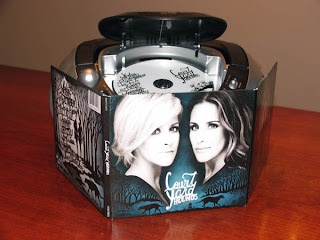 I loveeee the Dixie Chicks but I couldn't find one song that I liked on the Courtyard Hounds CD.. go figure! Thanks for visiting today and I'm following you back. The last song I bought was Billionaire by Travie McCoy. Have a great weekend!